Editors' note: This column was first published on 23 January 2018.
Business investment and productivity growth are low, even though interest rates are lower than they have been for centuries (Bean 2016). This paradox sits at the heart of one of the most feared economic afflictions of modern times – the problem of secular stagnation. A number of details make this paradox all the more puzzling. First of all, corporate profits are very high, which ought to foster animal spirits. Second, a gulf has opened between a small group of highly productive firms and a gaggle of laggards, with slow growth and low profits (Andrews et al. 2016). Third, this is not just any productivity growth slowdown – the slowdown is manifesting itself mostly in total factor productivity (TFP). So what is going on that the textbook is missing out? One story is a slowdown in underlying technical change. Cowen (2011) suggested that developed countries might have exhausted easy sources of good investments. Gordon (2016) argued that the inventions over the 20th century – such as electricity, indoor plumbing, and the like – were part of “one big wave of innovation” that will not be repeated. However, as many have pointed out, measuring and forecasting future technical change is very hard to do, and such a slowdown does not seem to have affected the leading firms. In our book (Haskel and Westlake 2017), we try a different tack. We start with the observation that over the past 20 years there has been a steady rise in the importance of intangible investment relative to tangible investment. As Figure 1 shows, by 2013, for every £1 of investment in tangible assets (buildings, machines, vehicles, etc.) the major developed countries spend £1.10 on intangible assets (such as software, R&D, design, branding, training, and business process engineering). We ask whether this move to intangibles helps explain secular stagnation. Note: GDP adjusted to include intangibles. To answer this, we start with the measurement and economic properties of intangibles. First, many intangibles are not measured. Following Corrado et al. (2005), we think of intangible assets in three broad categories: (1) computer related (software and data), (2) innovative properties (R&D, design, artistic originals), and (3) company competencies (marketing and branding, firm-specific training, business process engineering). National accounts measure software, artistic originals, and, most recently, R&D as investment. Database measurement is patchy and neither design nor company competencies are treated as investment. Second, intangibles have particular economic properties, many of which are well known to economists analysing information goods (Shapiro and Varian 1999, Lev 2001). One is the ability of firms to scale intangibles over their operations more readily than tangibles. Uber can serve more customers with their existing software, but Bob’s Taxis, your local taxi firm, has to buy more cars. Another is spillovers – firms cannot use their rivals’ tangible assets, but can potentially use their rivals’ intangible assets. A third is sunkenness – it’s hard to re-sell many intangible assets; and a fourth is synergies – intangibles are often highly valuable when combined with other intangibles. For example, consider how the R&D and design in an iPhone combine with the organisational design of the App Store and Apple’s supply chains, and with Apple’s own brand to create one of the world’s most profitable products. How does this help our understanding of secular stagnation? In our book, we review how, together, these measurement and economic properties might help understand secular stagnation. We do not claim it is the whole story, but that it might contribute to understanding the puzzle – in four specific ways. The first, and most straightforward link between intangible investment and secular stagnation is mismeasurement. If we mismeasure investment, then measured investment, GDP, and its growth might be too low. We draw upon nearly a decade of research that, using various business surveys, reengineers the national accounts to get a picture of GDP, industry investment, and capital assets using the broader range of intangibles (e.g. Corrado et al. 2009, Corrado et al. 2016). It turns out that whilst including previously unmeasured intangibles raises the investment/GDP ratio, it does not greatly affect its trend. Explanations 2, 3, and 4 relate to the unusual economic characteristics of intangibles. Explanation 2 relates to spillovers. Because intangibles tend to generate more spillovers, a slowdown in intangible capital services growth would manifest itself in the data as a slowdown in TFP growth. 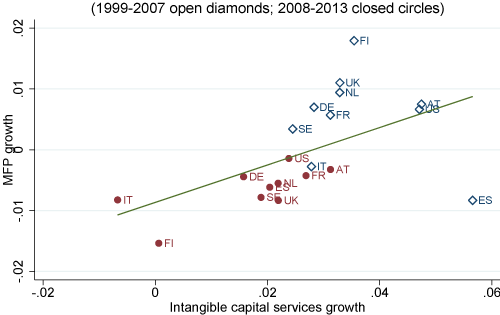 Figure 2 plots TFP growth and intangible capital growth for twelve countries before and after the Great Recession. Before the Great Recession, most of the countries are on the top right – that is, most countries (except Spain and Italy) had, on average, positive TFP growth, and this is associated with positive growth in intangible capital. After the Great Recession, the points are all on the left – both TFP and intangible capital growth have slowed down in all countries, Finland being a leading example. Granted, other things might be going on, but the figure suggests a possible link. The idea that intangible-rich firms are scaling up dramatically is supported by the anecdotal evidence of firms like Amazon, Apple, and Facebook, Microsoft – firms that own complexes of valuable intangible assets. The anecdotal evidence also suggests that, while all intangible investment tend to have spillovers, leading firms are disproportionately skilled at appropriating the spillovers of other firms’ investments (what management researchers call ‘open innovation’). Again, this is a phenomenon we see in intangible-intensive industries like tech and pharmaceuticals, where the most successful firms are known for their ability to acquire or simply copy good ideas arising in start-ups or competitors. If this is indeed true, the two-tier economy of leaders and laggards could help explain why underinvestment persists despite high recorded profits. Leading firms that enjoy a high rate of return on their intangible investments book strong profits, and have a strong incentive to invest more. But most firms cannot hope to get such a high rate of return, because they lack complementary intangibles to generate synergies and are less certain of appropriating the spillovers of their investment. As a result, aggregate levels of intangible investment remain low. Explanation four is even more speculative, but has been suggested to us repeatedly by non-economists with business experience in intangible-rich industries. They suggest that TFP growth could be slower because intangibles are somehow generating fewer spillovers than they used to. There might be a few reasons for this. One reason might be that laggard firms are less able to absorb spillovers from the leaders, since only the leaders can exploit the synergies between different intangible types than the laggards. If a greater proportion of intangible investments since 2009 were zero-sum, then we might also expect to see a decline in TFP, even if levels of intangible investment remained the same. Bessen (2016) looks at the relationship between regulation in industries (measured by an index of regulation and by political lobbying expenditures) and the valuations of public companies. He finds a significant portion of the increase in stock prices since 1980 is associated with intangibles (measured by R&D) but also spending on regulation and lobbying. So perhaps there is a skew of investment towards lobbying, legal arguments, and institutional reboots – none of which is immediately productive. There may, however, be a silver lining to this cloud. Suppose that the economy is in a transition phase to a new mode of production, one in which intangible investments are much more important (this is certainly the implication of the long-term trends of intangible investment). If this is true, we are in the process of working out the new norms of how such an economy would work – what are Uber’s rights over and obligations to its network of driver partners? What are Google’s rights over the data you have provided it over years of searching? Can John Deere sue you for fixing a tractor that runs its software? Early work on the IT revolution (Bresnahan et al. 2002, Basu et al. 2004) suggested that that the effective use of IT required co-investments in organisational change. Perhaps something similar is occurring as intangible capital is used more and more, in conjunction with movements to cloud and mobile computing. Since intangible assets tend to be contested more than tangibles, firms might be inclined to spend money asserting or protecting their claims to them – much of which would show up as intangible investment that generates little TFP, but will raise future TFP. If this is the case, it presents a complex but important challenge. It implies that TFP growth will continue to be low until governments learn to do a much better job of preventing rent-seeking and designing the institutions an intangible economy needs, and until firms and society work out what the commercial, legal, and even ethical norms of the new intangible economy are. This is important work, but it is analytically difficult, socially complex, and time consuming. Andrews, D, C Criscuolo, and P Gal (2016), “Mind the Gap: Productivity Divergence between the Global Frontier and Laggard Firms”, OECD Productivity Working Papers. Basu, S, J Fernald, N Oulton, and S Srinivasan (2004), “The Case of the Missing Productivity Growth, or Does Information Technology Explain Why Productivity Accelerated in the United States But Not in the United Kingdom?”, NBER. Bean, C (2016), “Living with Low for Long”, The Economic Journal, 126 (592): 507–22. Bessen, J (2016), “Lobbyists Are Behind the Rise in Corporate Profits”, Harvard Business Review, May. Bresnahan, T F, E Brynjolfsson, and L M Hitt (2002), “Information Technology, Workplace Organization, and the Demand for Skilled Labor: Firm-Level Evidence”, Quarterly Journal of Economics, 117 (1): 339–76. Brynjolfsson, E, and L M Hitt (2000), “Beyond Computation: Information Technology, Organizational Transformation and Business Performance”, Journal of Economic Perspectives, 14 (4), 23–48. Corrado, C A, J Haskel, C Jona-lasinio, and M Iommi (2016), “Intangible Investment in the EU and US Before and Since the Great Recession and Its Contribution to Productivity Growth”, 2016/08, EIB Working Papers. Corrado, C, C Hulten, and D Sichel (2005), “Measuring Capital and Technology: An Expanded Framework”, In C Corrado, J Haltiwanger, and D Sichel (eds. ), Measuring Capital in the New Economy, 11–46 Studies in Income and Wealth, no. 65, Chicago: University of Chicago Press. Corrado, C, C Hulten, and D Sichel (2009), “Intangible Capital And US Economic Growth”, Review of Income and Wealth 55 (3),661–85. Cowen, T (2011), The Great Stagnation : How America Ate All the Low-Hanging Fruit of Modern History, Got Sick, and Will (Eventually) Feel Better, Dutton. Gordon, R J (2016), The Rise and Fall of American Growth: The U.S. Standard of Living since the Civil War, Princeton, NJ: Princeton University Press. Haskel, J, and S Westlake (2017), Capitalism Without Capital The Rise of the Intangible Economy, Princeton, NJ: Princeton University Press. Lev, B (2001), Intangibles, Brookings Institution Press. Shapiro, C, and H R Varian (1999), Information Rules : A Strategic Guide to the Network Economy, Harvard Business School Press. To really test this we would need full intangible investment data for each firm to see if it correlates with inequality of profitability. But accounting conventions don’t let us do this yet, at least for the full range of intangible indicators. In Haskel and Westlake (2017) we do show that industry productivity spread rose the most in more intangible-intensive industries. Of course, tangible investments can be zero-sum too – consider a firm that builds a tunnel that has no other use than to allow slightly faster high frequency trades to be executed between two financial centres – but these seem rarer than zero-sum intangible investments.